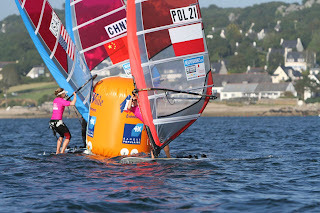 I spent three weeks in Brest, France, training for and competing in the RS:X European Championships. This event had over 200 entries in both the senior, youth, and RS-One event, making it the biggest and most competitive event this year. 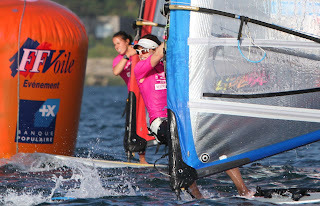 Brest is a challenging venue, with high cliffs, strong tidal current, and gusty, shifty wind. It's also situated on a peninsula that juts far out into the Atlantic, which makes the weather very UK-like: chilly and rainy. I'm not sure that Brest has a "classic" condition, but I saw just about every wind direction and strength during my time there. I continued work with my newest coach, Curro Manchon from Spain, and his sister Blanca, who is an excellent and experienced sailor. 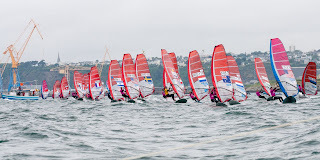 We did a training camp a week before the event, and because the event was so big, we had a really large, competent fleet of youth and senior sailors to race with. 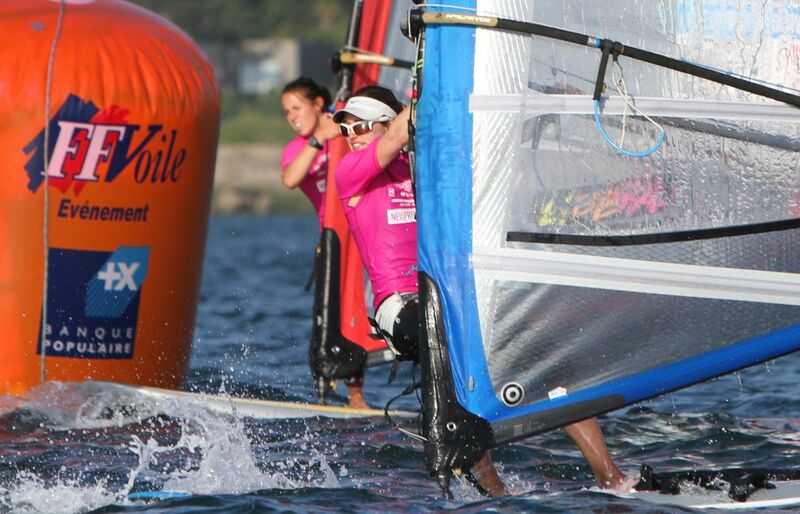 This, the challenging wind conditions, and the strong current made this training camp a very valuable experience. 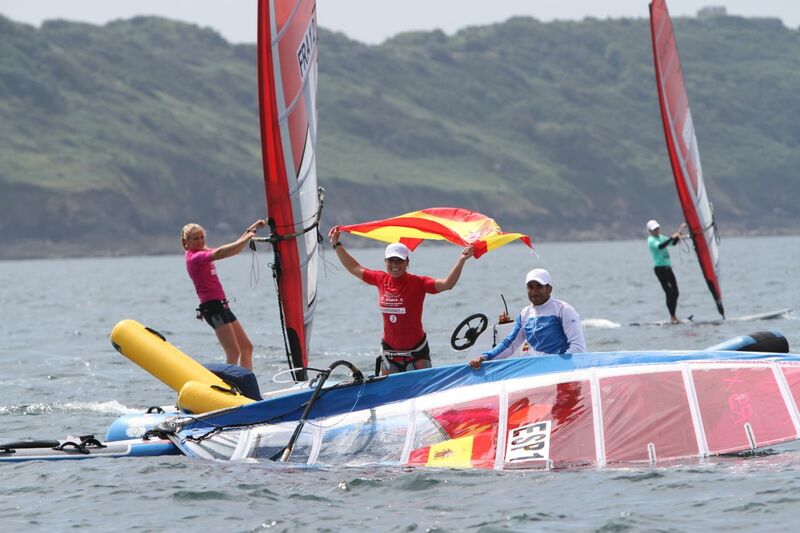 Going into the event, I had a bad first day in planing conditions, which are currently a strength. I knew I needed to turn things around, and after that I was able to jump back up the fleet with a few top-10 finishes. I am still inconsistent in my finishes, but I now have the speed and am rapidly gaining the tactical knowledge to get there. The simplest tactics always are the most successful. In my top races, I had a clean start and went to the side I thought was the best with good speed. I covered the fleet and stayed in the best pressure. As long as I maintained speed, staying in the front was relatively simple! After the first day, the wind dropped off and we competed through a few rainy, gusty days. The women's fleet raced together for the first two days in a qualifying round. After the lay day, we experienced a dramatic change in the weather, as it finally became summer in Brest. The sun came out, the wind died, and we waited until 7 pm to race! 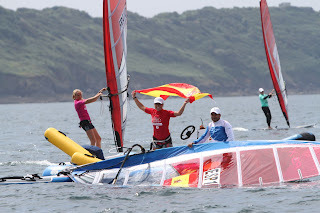 The remaining few days weren't much better, although the race committee continued to race us in the light conditions. 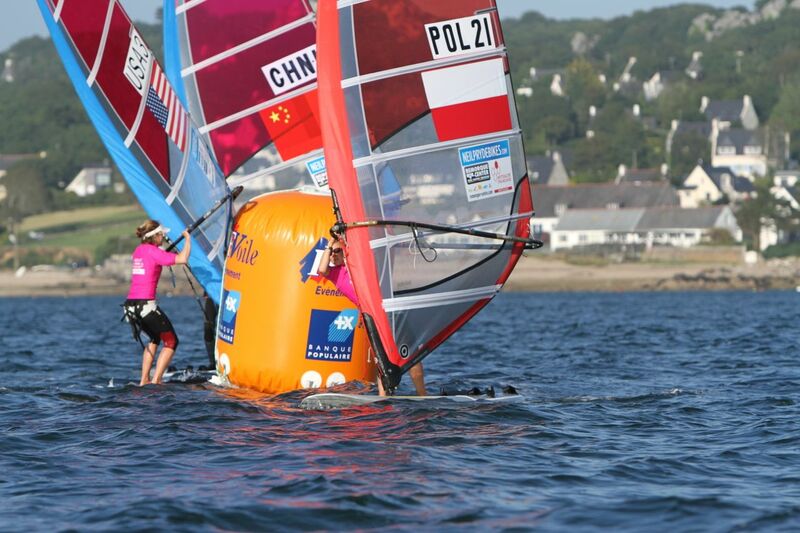 Again, sailors were put through a nonsensical scoring format courtesy of the RS:X Class. 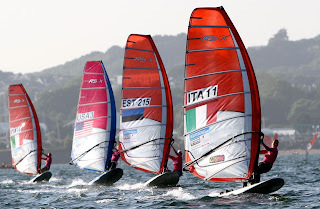 After the qualifying series, the fleet was split asymmetrically into a group from 1-26, and 26-42. The points were condensed to placement, with only one point separating sailors. After the final series, the scores were condensed again, and the organizers held one final race. 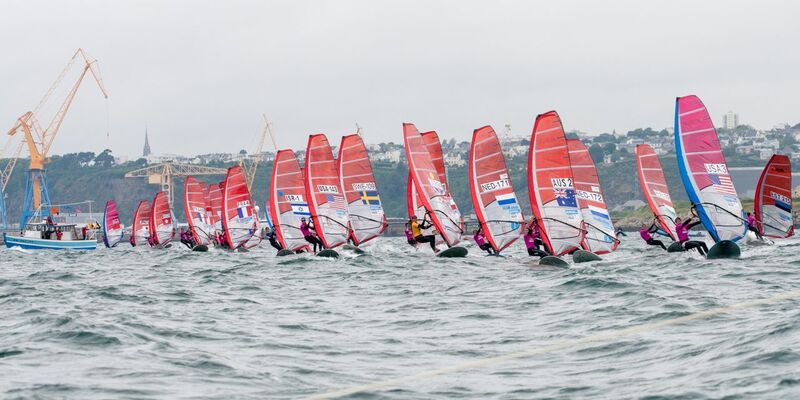 Like sailors have seen again and again this year, this format doesn't reward consistent finishes - it makes competition more unfair and confusing. Competitors themselves didn't know what would happen with the scoring until the race committee announced it. Regardless of scoring, my event was a success. With a finish of 14th place, I am racing with the best. Once I minimize my mistakes, I will jump up the fleet. I left feeling confident about my progress, knowing exactly what my mistakes were, and how I can keep moving forward. I was also very happy to see my training partner Blanca Manchon take the bronze medal! I am now in New York aggressively pursuing fund raising opportunities. I have reached a critical point where without funding, I will be unable to continue campaigning. I am optimistic about my chances here and hope to have some good news to report once I return to Annapolis next week.